Sonny was 14 years old. WE MISS YOU VERY MUCH SONNY - YOUR SMILING FACE AND YOUR WAGGING TAIL - ALWAYS HAPPY. PEACE AND OVER THE RAINBOW TO JOIN THE REST OF YOUR KELPIES MATES. Aust.Ch.Mountainmist Sunaru is the son of the living legend Aust.Gr.Ch.Wingdari Uluru. 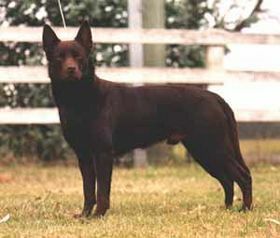 The Kelpie Speciality Sunaru won BEST IN SHOW. Uluru has won Best in Shows over the previous years. Sunaru has been Challenge Dog and Best of Breed, Res. Ch. Dog over the years at the Sydney Royal Dog Shows, Challenge Dog RUBOB at Brisbane, Canberra Royals. At the Federation Dog Show in the ACT Sunaru won Best Australian Bred in Show. Only a young dog he is well on the way to his Grand Ch. title following in the footsteps of his father. Sunaru is a proven sire - pups now in the show ring. 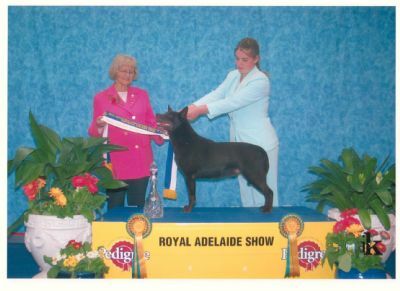 Canberra Royal 2002 Sunaru won again Ch.RUBOB. 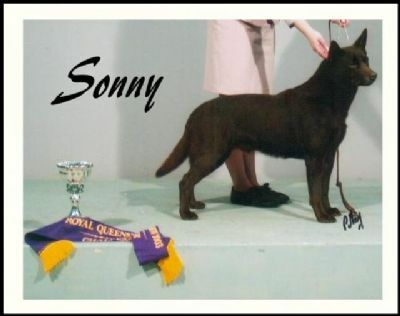 Sonny is producing top progeny who are now Australian Champions and Best In Show winners and consistently winning in the show ring. Sonny's progeny are also overseas being trained as work and rescue dogs, tracking dogs and excelling at obedience and agility. His lastest great win was Challenge Dog, Best of Breed, Runner Up Best Exhibit in Group, Best Australian Working Dog at Adelaide Royal under a Finnish judge. What an achievement for a Kelpie. His young son Chaos just won Best Exhibit in Show All Breeds. Our records say it all - consistently winning where it counts!!! Sonny is the son of the great "Uluru" - again the living legend lives on!!!! Son, daughter, grandchildren and great grandchildren all winners!! !.